Rural revitalisation: Kuitua Pohjoiseen (Finland) - This project helped villagers set up cooperatives and apply for public grants to build their own hi-speed broadband networks. Social inclusion: Enerterre HELPS (France) - Promoting the voluntary renovation of traditional houses to the benefit of people in fuel poverty in rural areas. LEADER: Tiges chavées (Belgium) - Supporting the sustainable management of local small private forests through training, tailored advice and awareness raising. Popular vote: Zeitgeist-Enns (Austria) - Successfully demonstrated a pop-up temporary shop concept in vacant sale spaces in the snall Austrian town of Enns, revitalising the local life. Scotland was well represented at the event with nominations for Castlebank Park who were nominated under the ‘LEADER’ category, and GrowBiz Perthshire who were nominated in the 'Rural Revitalisation' category. 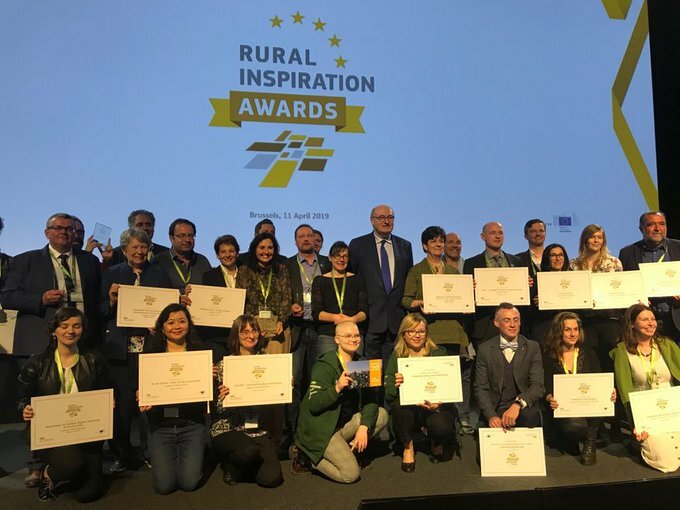 The event consisted of a full 2 day plenary celebrating the past 10 years of rural networking across Europe, with plenty of opportunity to share ideas and meet rural stakeholders. The Scottish Rural Network were proud to host a spotlight session showcasing Scottish culture, with a live bagpiper performance as well as a whisky and shortbread tasting session. You can check out our pipers performance here. Many thanks to our colleagues at Scotland House in Brussels for their help! This event has happened at a pivotal time politically for Scotland, where it is of utmost importance that we showcase Scottish culture and rural development on the international stage. We hope we did it justice! You can catch up on our social media posts from the event by searching the hashtags '#RuralNetworking' and '#RuralInspirationAwards' on our Twitter and Instagram.